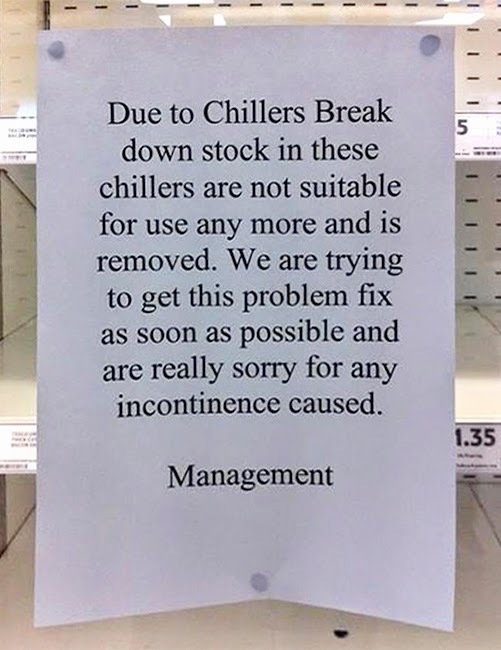 Thanks to Trev L for pointing out this notice which was displayed at the Tesco Express store in Kingsland Road, Hackney last week, and photographed by David Sparks. Quite a lot of support has been shown for Dilal, the Store Manager, and his staff. For, despite the grammatical errors and the, ahem, rather messy malapropism, no one has yet been, er, discharged. I'm guessing that a surge in diaper sales has ensured staff retention.